The season of giving is upon us, and at times, that can be overwhelming! So many people to shop for and so much money to spend! Luckily, I have an AWESOME DIY gift idea for you that is so inexpensive to make but so fun, too! 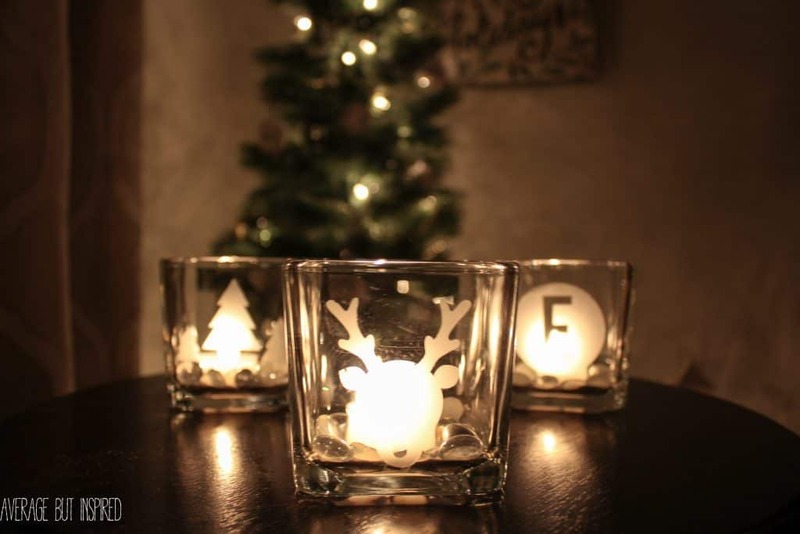 DIY etched glass votive holders are a really simple project, and they can actually be used in a few different ways (which I’ll fill you in about below). 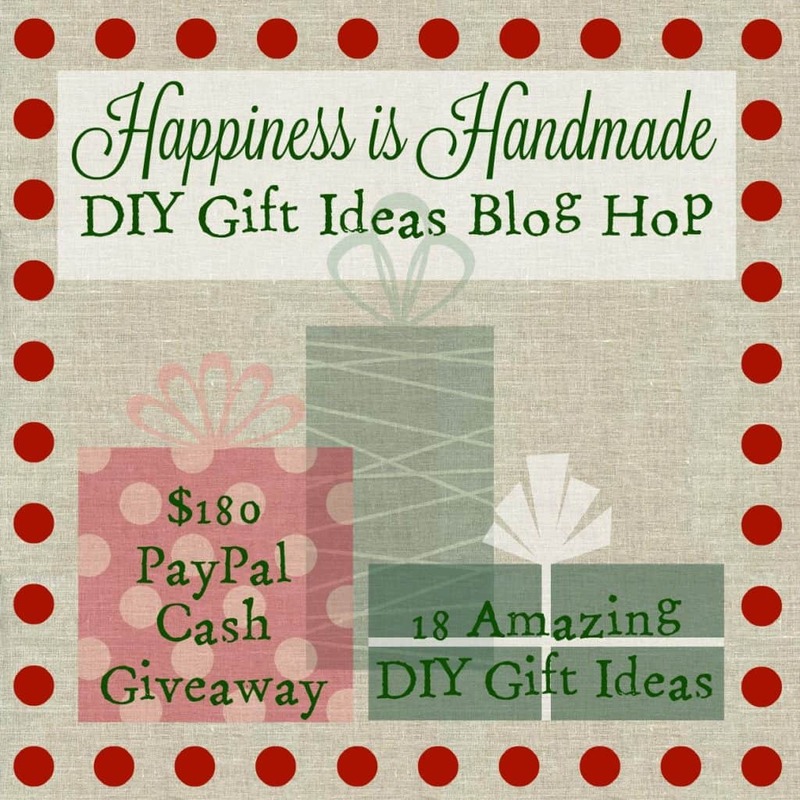 But guys, that’s not the only idea you’ll find here because this post is part of the Happiness is Handmade DIY Gift Ideas Hop! For this blog hop, I’ve teamed up with seventeen other fabulous bloggers to bring you EIGHTEEN awesome DIY gift ideas that will be perfect for your gift giving needs this holiday season! You’ll find links to all of the ideas right at the bottom of this post! 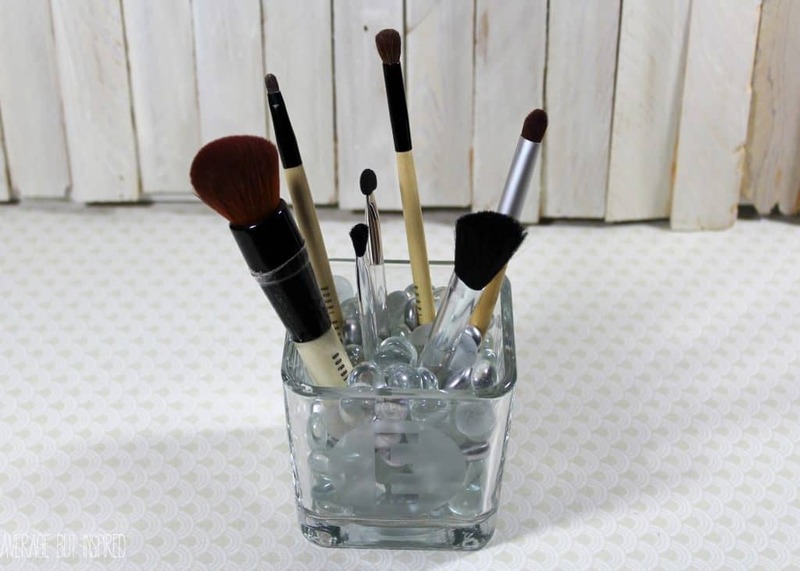 So before you check out the other fabulous gift ideas and enter the giveaway, let me show you how easy it is to whip up a bunch of etched glass votive holders (or makeup brush holders or vases). 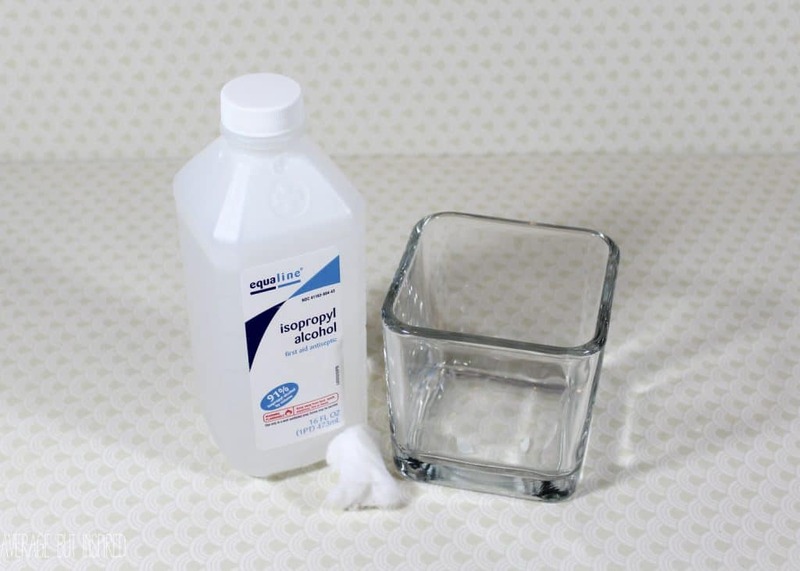 First up, you need to clean the glass to make sure it’s free of any oils or residues. Gently wipe it with a cotton ball that’s been soaked in rubbing alcohol and let it dry. Next, if you’re creating your own stencils on a paper cutting machine, like a Silhouette, make your designs and measure them to fit the front of the glass vase. (Simple shapes are best. I used seasonal silhouettes, state shapes, and monograms.) Mine were just about 2″ wide and high. Cut them on contact paper (Speed 8, Thickness 3, Blade 1), and press them onto the glass. Make sure they’re firmly pressed down along all edges! If you’re going to do your etching with a glass etching stencil, make sure to follow the directions on the stencil package. 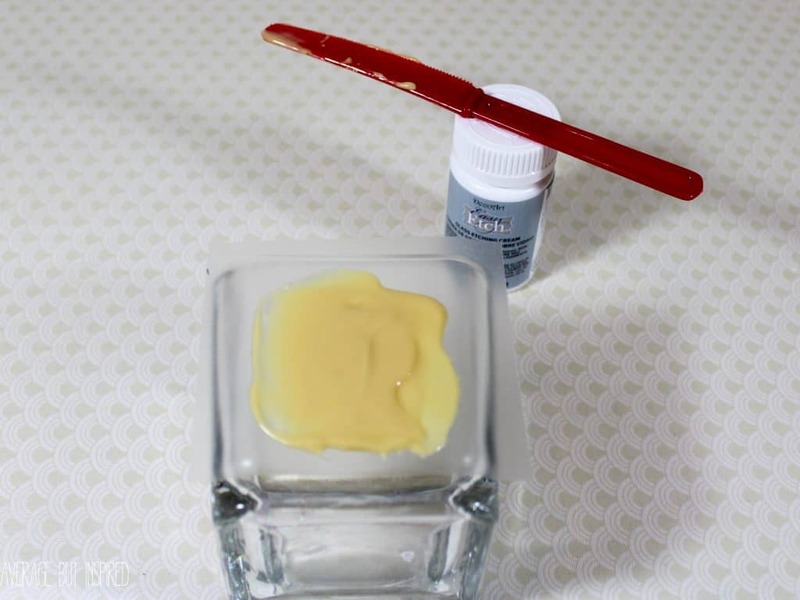 Apply the etching cream to the glass, using the plastic knife or palette knife, and make sure to cover the entire area to be etched. Let it sit according to the directions on the package (mine took about 15 minutes). After the proper amount of time has passed, use the plastic knife or palette knife to remove the cream from the glass. The directions of my etching cream said I could reuse that cream, so I put it back into the container. 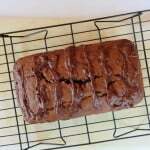 Rinse off the excess cream and gently pat dry with a paper towel. Pop in your votive candles and enjoy! This was my first time using glass etching cream, but I am OBSESSED. It is like magic in a jar! I honestly did not think it would work, but it did, and I love it! One good thing to note is that the etching is dishwasher safe, too! 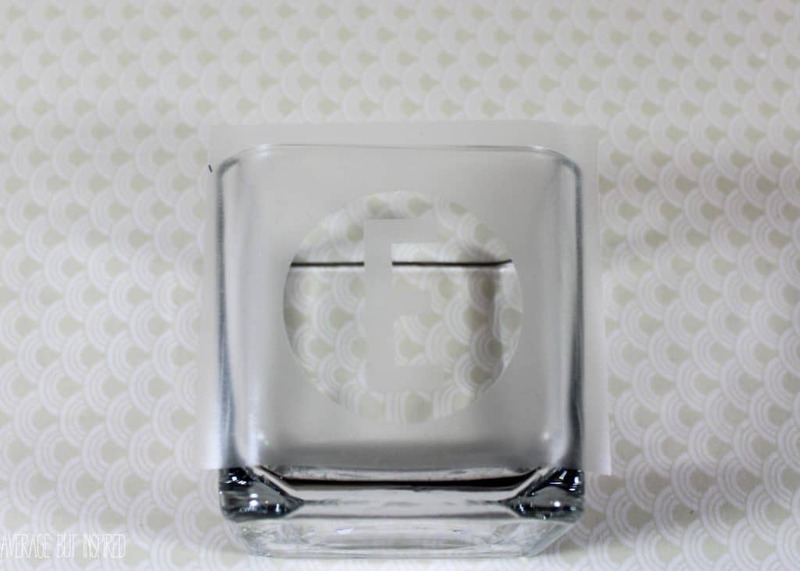 Now I will be giving my etched glass as votive holders this holiday season, but I think you could easily give them as makeup brush holders or vases. Pretty cute, huh? 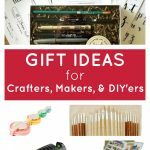 Now that you’ve seen how easy and affordable it can be to make your own holiday gifts, check out these other ideas that my friends have come up with. I know you’re going to love them! LOVE it Bre! SO pretty!!! Very festive! Most everyone loves candles, so these would make a great gift. Now if I just had a Silhouette Cameo machine! Yet another awesome reason to get my Silhouette machine out of the box! Love these little votives! I LOVE these! I’ve always wanted to try glass etching but thought it was too hard. You make it look so easy!! Thanks for the tips on the settings to use one the cameo too; I’ll be trying this next week. Ahhhhh I NEED to get one of these machines! These are too cute and thanks for sharing this awesome idea! These are so cute! I love that they are so versatile and easy to personalize. Such a great handmade gift! 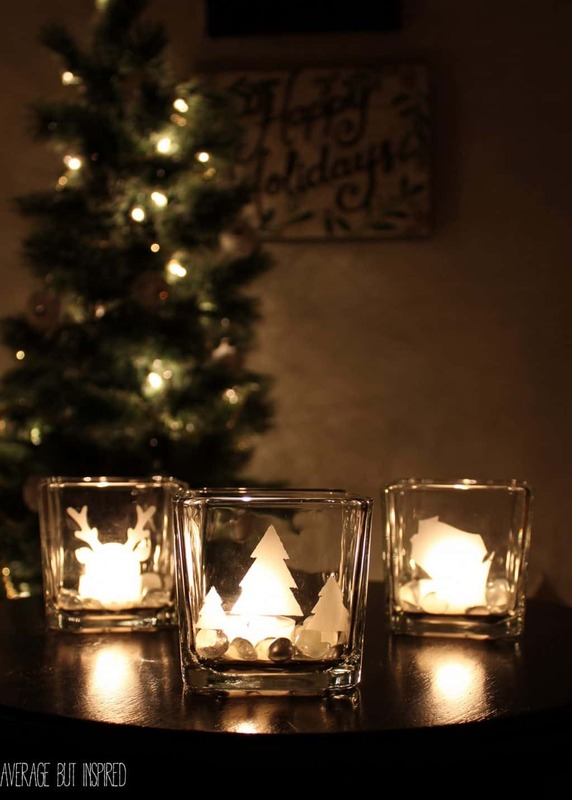 These votive holders are soooo pretty, Bre! I’ve always wanted to learn how to do glass etching. Thanks for sharing this fantastic tutorial. These are seriously cute, Bre! I’ve never even heard of etching cream. Can’t wait to try it! 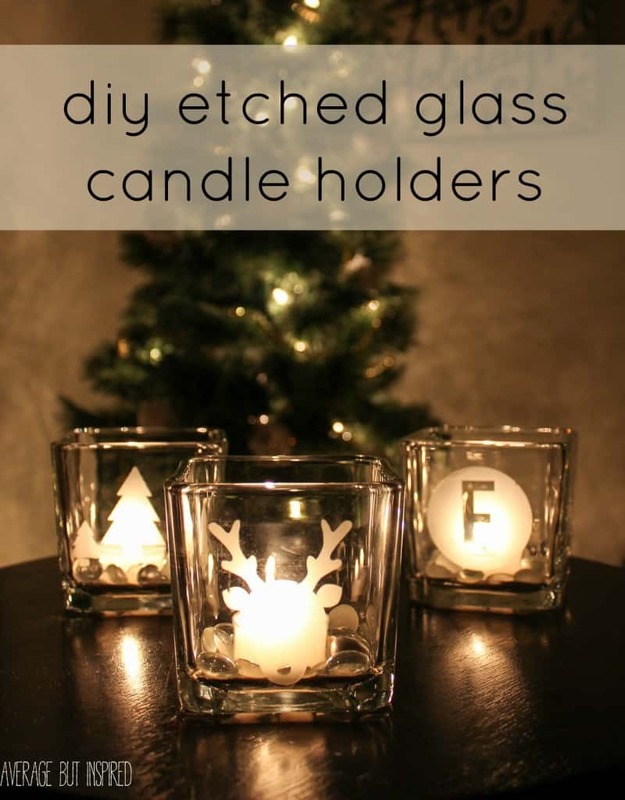 These turned out great – and I love all the different uses you thought of besides candle holders! I’ve never used etching cream before (it still seems so weirdly magical to me), but you made it look easy and like something I should probably just try! This is a great idea. Thanks for sharing. 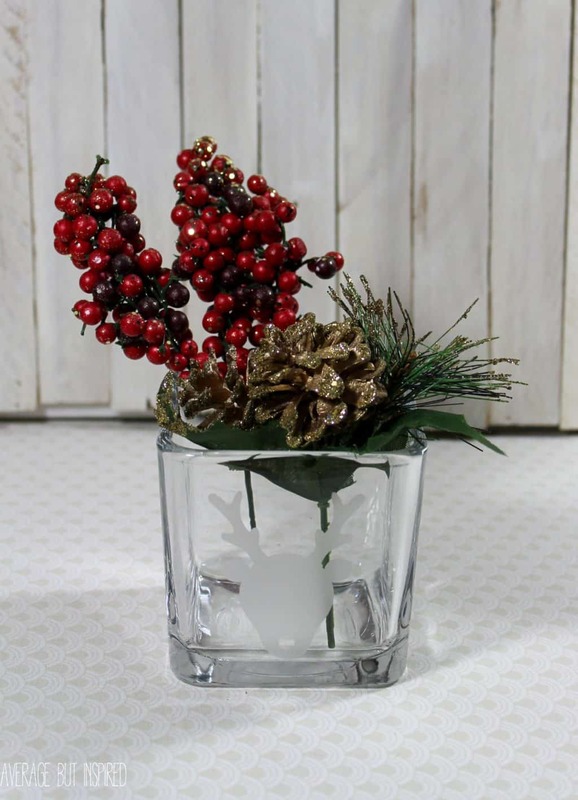 This will be perfect for a beautiful Christmas table as candle holders! Oh, these are so cool, Bre! They look so pretty with the candles in them. I need to get my hands on some etching cream! I love this idea and am going to try it after Retirement kicks in. You are so creative and talented!! Can the stencil be reused once the etching cream is wiped off?